UPDATED: Sat., Feb. 2, 2019, 11:20 p.m.
MORAGA, Calif. – Jenn Wirth had 14 points and seven rebounds and No. 15 Gonzaga never trailed in its 66-52 women’s basketball win over Saint Mary’s on Saturday night. 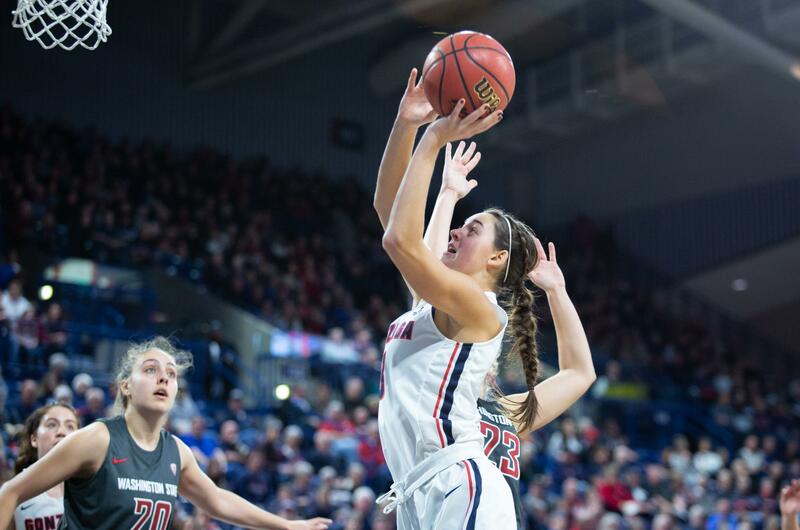 Jill Townsend added 12 points for Gonzaga, and LeeAnne Wirth and Katie Campbell scored 10 apiece. The Bulldogs (21-2, 10-1 West Coast Conference) have won five in a row and moved into first in the conference standings, a half-game ahead of No. 25 BYU – which beat Gonzaga 70-68 in Provo, Utah, on Jan. 17. Jenn Wirth scored eight consecutive points before twin sister LeeAnne hit a jumper to cap a 10-0 run that gave the Bulldogs a 28-17 lead with 2 minutes, 51 seconds left in the second quarter. Saint Mary’s scored eight of the next 10 points to pull within five but got no closer. The Gaels went scoreless over the final 6:17 of the game. Sam Simons had 16 points, including four 3-pointers, and Sydney Raggio scored 11 with 16 rebounds for Saint Mary’s (14-8, 7-4), which had its five-game win streak snapped. The Gaels, who were held to their lowest scoring output of the season, committed 21 turnovers. They came in ranked No. 1 in the conference in scoring (77.7 points per game), 3-point percentage (.390, eighth nationally) and field-goal percentage (.492, ninth) but shot 4 of 22 (18 percent) from 3-point range and shot 32.7 percent (18 of 55) overall. Gonzaga continues play on the road next week, heading to Portland Saturday for a 4:30 p.m. tip. Published: Feb. 2, 2019, 9 p.m. Updated: Feb. 2, 2019, 11:20 p.m.